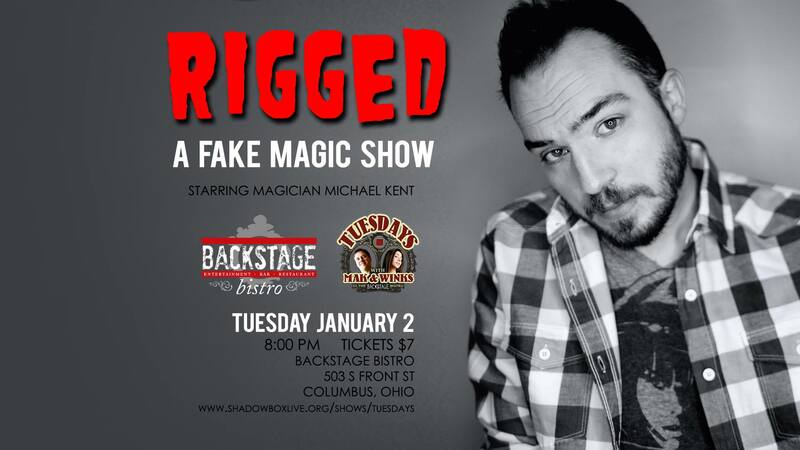 Columbus Magician Michael Kent is one of the busiest comedy magicians in the country…and he knows you’re not stupid. Magic isn’t real. But after this show full of fake magic, you may think it is. About Backstage Bistro: Located in the “Brewery District” of Columbus, OH, the Backstage Bistro is an open, exposed-brick space offering salads, pizza, panini & American mains, plus comedy shows. It is located at Shadowbox Live®, which is regularly named “Best Theatre in Columbus” in various Columbus, Ohio publications. About “Tuesdays with Mak and Winks: Tuesday is the new Friday! Join Shadowbox Live’s® head writer Jimmy Mak and standup comedian Nickey Winkelman every Tuesday night in the Backstage Bistro. Each week is something different — from standup comedy, drag shows, sketch comedy, magic, burlesque and more. There’s never a dull moment when you’re spending your Tuesdays with Mak and Winks! About the Artist: There’s a reason Columbus Magician Michael Kent has been named ENTERTAINER OF THE YEAR by Campus Activities Magazine and MAGICIAN OF THE YEAR by The Association for the Promotion of Campus Activities. Michael gives magic a facelift with irreverent comedy and satire. His unique style of performing comedy magic has made him a FAVORITE in over 500 college campuses he’s visited. Michael has performed for audiences all over the globe – from Hollywood, California to US Troops serving overseas. Many of his clients book him YEAR AFTER YEAR because audiences can’t wait to see the show again! He’s been featured on the television show “Penn & Teller: Fool Us” on The CW Network. In a style reminiscent of a late-night talk show, Michael invites the audience to laugh with him at the absurdity of a modern-day magician. Michael’s audiences experience what its like when a stand up comic performs (and occasionally pokes fun at) the art of magic.